One of the most basic (and most important) steps in setting up your online store is creating the products that you'll be selling in the system. Products have many attributes, allowing you to create a wide range of product types. This guide walks through adding just a simple product, using the defaults for as many options as possible. For a more in-depth explanation of all the product attributes, please see this page. 1 - First, click on Organization → Manage Categories in the admin menu. 1 - First, go to Products → Manage Products in the admin site, and expand the tree by clicking the + next to the category you just created. 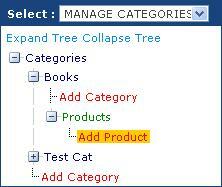 2 - Next, click the + next to 'Products', and then click on 'Add Product'. Display Format XmlPackage The XML package chosen here determines how the product detail page is laid out. For this product, we'll use product.simpleproduct.xml.config, the most basic of the packages. 4 - Every product should have images as well, so next click on the Images tab. By default, the software is set up to create icon (which display in the cart and on category pages) and medium (which display on the product detail page) images when you upload large (which display in a special popup window from the detail page) images, so click the Large 'Browse' button and upload the image you'd like to use for this product. 5 - Now your product needs a price. 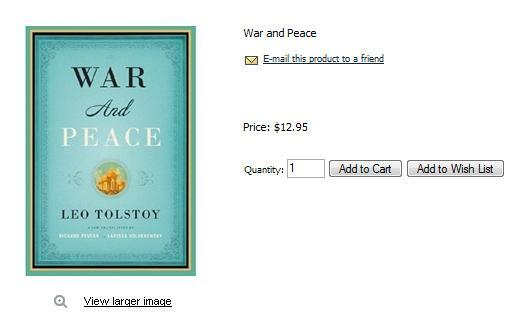 Click on the Variant tab, and set a base price for the product. 6 - Finally, click 'Add New' at the bottom, and your new product is complete.